Cannibalism is surely the last thing on your mind when you’re at a funeral. However, when you tuck into a piece of cake at the reception that follows, you’re most likely honoring a tradition with its roots in eating people. The custom of serving breads and cakes at funerals can be traced back to the mortuary endocannibalism practiced by our Paleolithic ancestors. They believed that by eating their dead, they could commemorate them and absorb their essence, thereby keeping them a part of their lives. This, in turn, comes from the idea of the sacred meal shared between gods and humans, which evolved into the idea of consuming the gods to incorporate their virtues. The Aztecs ate bread baked in the form of gods; Catholics continue to celebrate the Holy Communion by eating the body of Christ in wafer form. Eventually, eating the gods turned into eating our beloved relatives—which, in time, transformed into the casserole you chew glumly after your grandmother is laid to rest. “We went from the actual consumption of a human body to leaving spiritual nourishment for that person,” culinary writer Sarah Lohman explains. 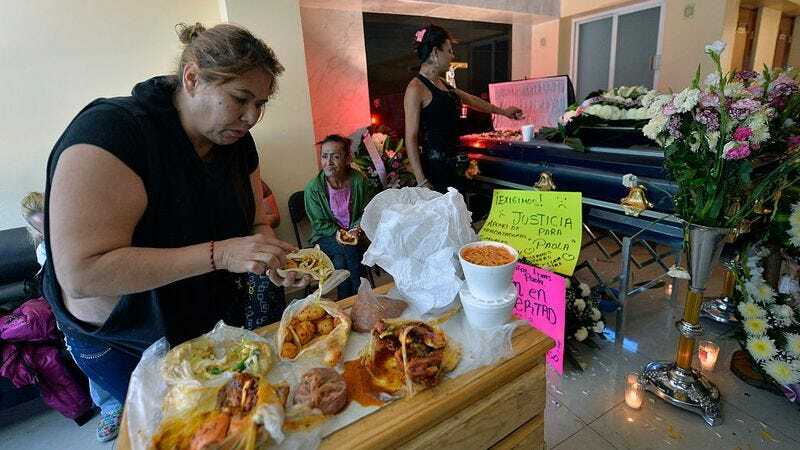 Lohman, who has lectured on the history of funeral food, believes this transition occurred 5,000 to 10,000 years ago, then evolved into mourners sharing those food offerings with each other, some of whom needed to be fed after long journeys to pay their respects. Much of that funeral food contained some form of wheat, which has long represented resurrection, self-sacrifice, and the cycle of life. The power of that symbolism proved so enduring that many cultures still eat wheat-based foods at memorial services to this day. Coliva, for example, dates back over 2,000 years, and it remains a staple at funerals in Middle Eastern, Greek, Slavic, Balkan, Italian, and Serbian communities. Made from boiled wheat kernels, coliva is usually shaped to look like a mound of earth resembling a grave, then sprinkled with a thick layer of powdered sugar. Colivas are often decorated with a simple cross or the initials of the deceased, and sometimes embellished with elaborate designs using raisins, nuts, and seeds. While coliva is also enjoyed at other occasions, there are some breads you’ll never see outside of funerals—and for good reason. In Celebrating Life Customs Around The World: From Baby Showers To Funerals, author Victoria Williams describes how, in medieval Germany and parts of Central Europe, dough was left to rise on a corpse’s chest, then later baked and broken up among mourners. They believed that the “corpse cake,” as it was called, would absorb the positive traits of the dead and transfer it to those who ate it. The superstition can also be found in the later consumption of arvel cakes—more of a rich, slightly sweet bread—as well as in the tradition of sin-eating. Sin-eating was a kind of last-minute insurance that the dead would reach heaven, regardless of how they’d behaved while they were alive. Williams explains that in British culture, bread and salt would be left on a corpse to be eaten by “a person of the lowest possible social standing.” The sin-eater, after absorbing the sins of the deceased, would then be kicked and beaten by mourners before being thrown out of the funeral. (It just goes to show, no good deed goes unpunished.) Afterward, the mourners would be given arvel cakes flavored with caraway seeds to represent new life, served over the corpse by the bereaved family. As societies and cooking methods evolved, funeral biscuits emerged in the 18th and 19th centuries and gained popularity as souvenirs in England and the United States. While the British upper class preferred to give away hot-dog-roll-sized ladyfinger biscuits, early Americans used a shortbread type of cookie stamped with decorative designs. Lohman believes that the American version was influenced by Dutch settlers and their doot coekjes, or “dead cookies.” American funeral cookies were spiced with caraway, or sometimes ginger or coriander, then stamped with beautiful designs like “a skull and crossbones, or a rooster that represents resurrection. A rose was a popular motif, especially if it was for a child.” Funeral biscuits have since died out as a custom in America and the United Kingdom, but in some regions of Italy, biscuits in the shape of bones called ossi di morti (“bones of the dead”) and even in the shape of organs are still served to mourners. In Asia, the important grain isn’t wheat but rice—another symbol of life. Rice is the one dish present at every Asian funeral, regardless of social class. Chicken is also rich with symbolism within Chinese culture; eating it is supposed to help the deceased’s soul fly to heaven. There’s also duck, which protects the spirit when it crosses the three rivers along the path to the afterlife. More traditional Chinese funerals still engage in sin-eating, with some families asking monks to transfer the sins to dishes of dim sum, which are then eaten by sin-eaters. Fortunately, they’re allowed to leave without being kicked or beaten. Families who follow Chinese traditions will also give mourners a piece of candy to be eaten at home, similar to the Mongolian custom of eating a lump of sugar dipped in milk after a funeral. The ritual is meant to purify them after coming in contact with death. With or without that symbolism, eating something sweet during or after a funeral remains a universal practice. Although the benefits of eating sweet food, packed with sugar’s ability to lift the mood, seem obvious, it’s also important to note that the funeral treats of old weren’t sweetened with sugar but rather honey, one of the most symbolically significant foods in human civilization. It’s believed that ancient cultures from the Chinese to Africans buried their dead with pots of honey, while the ancient Greeks sent off their dead with a honey cake, which they were supposed to use as a bribe for Cerberus at the gates of Hades. In fact, with its amazing antibacterial and preservative powers (it never goes bad), honey may be the ideal funeral food, for both the living and the dead. It’s no surprise that slices of halva—a honey-sweetened, chewy and flaky confection that dates back to the fifth century, and whose variants are easily found across the Middle East, Central Asia, North Africa, Europe, India, and China—is still served at contemporary Muslim funerals. Although modernization has eroded many traditional funeral customs and changed the food that’s served, sharing a meal with loved ones continues to be a significant part of the mourning process. You may or may not be eating your relatives, but simply sharing a cup of coffee and slice of cake with your family, or whatever tray you pick up from the supermarket deli, is every bit as rich in symbolism, a way of marking a loved one’s passing by ending on a sweet and hopeful note.